A ball toy is a must-have for any dog that loves to fetch. Ball toys come in many varieties, from the basic tennis ball or rubber ball to glow-in-the-dark and flashing-light balls. Some balls contain squeakers or holes for treats, while others are basic bouncers meant for retrieving. Try a product like Chuckit! to allow you to throw balls further and for slobber-free ball handling. When choosing a ball for your dog, pick one that is large enough for your dog to carry without accidentally swallowing it. The basic tennis-ball size works fine for most dogs, but there are also extra-large balls for giant dogs and mini balls for tiny dogs. 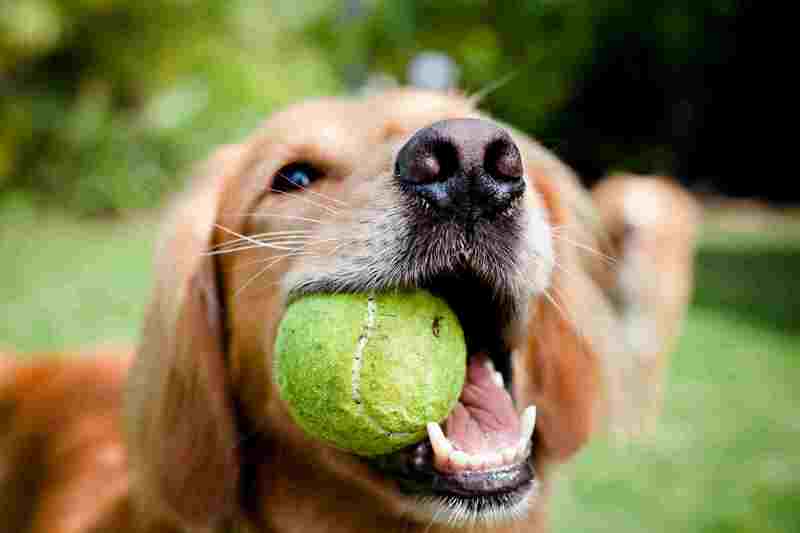 In general, avoid leaving tennis balls around for your dog to chew on. Believe it or not, the material in tennis balls can cause the teeth to wear down and pieces can lead to choking or gastrointestinal obstruction if ingested. Dogs that love balls and playing fetch also tend to enjoy discs and other retrieval toys. The disc is a bit more versatile than a ball when it comes to fetching, as you can vary the speed of the disc and cause it to change direction, further challenging your dog. There is even a dog sport that involves disc retrieval. Other retrievers, such as the Hurley give your dog a uniquely shaped toy to fetch. They may be made of rubber, plastic, rope or another material. Many dogs adore plush toys. They will carry them around like babies or tear them apart like prey. Stuffed dog toys usually contain squeakers and poly-fill. Dogs often rip into them and stuffing goes everywhere. Many dogs seem to be trying to "kill" their "prey" by destroying the squeaker. After the toy is "dead" they still sometimes carry them around and shake them. Supervise your dog when she plays with plush toys to keep her from swallowing stuffing or squeakers, which can lead to GI obstruction. If you are sick of cleaning up the stuffing from your dog's plush toys, try a stuffing-free toy like Skinneeez. These are basically the outside of stuffed toys with squeakers but no stuffing. Plush toys will not last long with aggressive chewers, but can still be plenty of fun (with supervision). Some companies make extra tough plush toys for longer lasting chew time, such as Kong Ballistic. Non-plush squeaky toys come in many shapes and sizes. Typically, they are made out of vinyl, rubber or plastic. Durability varies, so choose wisely according to your dog's chewing habits. Generally, thick rubber is best for aggressive chewers. Thinner vinyl or plastic toys are better for mild chewers or if you will be supervising play at all times. The benefit of thinner squeaky toys is that they are often very inexpensive. The downside is that they don't typically last very long. Rope toys are made of braided rope and sometimes have rubber or plastic parts. They can be used for fetch, tug-of-war or simply chewing. Many dogs love rope toys, while others have no interest. The action of chewing on a rope toy can actually be good for your dog's teeth as it creates a brushing-like action. However, aggressive chewers can easily shred rope toys and may ingest pieces. This can lead to serious gastrointestinal obstruction. Never let your dog play with rope toys unsupervised. When your rope toy begins to unravel, it's time to throw it away. Many dogs enjoy playing tug-of-war. It's a healthy display of a dog's predatory nature, plus it's great mental and physical exercise. There are many types of tug toys on the market in various shape, sizes, and materials. Often seen are tug toys made of rope and/or rubber. Choose a tug toy that is comfortable for you to hold in your hand and pull on, as well as easy for your dog to bite and pull on. In addition, tug toys should be durable enough to hold up to the strength of your dog's pulling. Replace worn or fraying tug toys so they do not break in the middle of a game of tug-of-war and hurt someone. Floating toys are great for dogs that love swimming. Usually made of a foam, rubber or plastic material, floating balls, rings, and other toys are easy for your dog to find and grab in the water. Food and treat dispensing dog toys should be in every dog's household. They offer fun, mental stimulation, and are a great way for dogs to funnel their energy. Food dispensing dog toys come in various shapes and sizes and are usually made of rubber or plastic. Perhaps the most popular of all food dispensing dog toys is the Kong, which can be filled with treats, kibble, peanut butter and other foods and can provide hours of fun for your dog. Similar to food dispensing toys, interactive toys and dog puzzles engage your dog mentally. Some interactive dog toys are simply the food dispensing toys mentioned above. Others engage you and your dog together and can be as basic as a tug toy or fetch toy. Dog puzzles are designed to challenge your dog. They contain compartments and mechanisms that hide food or treats and require your dog to figure out how to get to the food. One example of an excellent dog puzzle is the Nina Ottosson Dog Tornado. Interactive dog toys and puzzles are a great way to keep your dog mentally stimulated and to teach her some cognitive skills. The built-in reward system of puzzles really makes learning fun and easy.